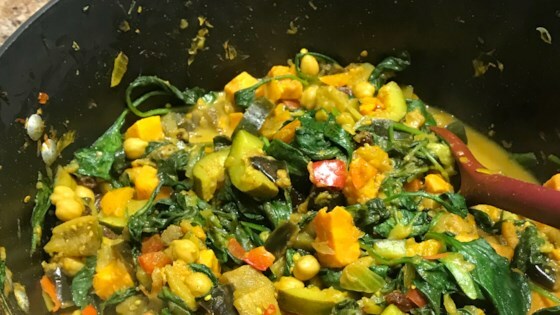 "A vegetable-full curry! Serve this curry over your favorite rice and you're sure to have a tasty meal. If you have carrot-ginger juice available to you, try using it in place of the orange juice - either one is delicious!" In a large Dutch oven place sweet potato, eggplant, peppers, carrots, onion, and three tablespoons oil. Saute over medium heat for 5 minutes. In a medium saucepan place 3 tablespoons olive oil, garlic, turmeric, curry powder, cinnamon, salt and pepper and saute over medium heat for 3 minutes. Pour garlic and spice mixture into the Dutch oven with vegetables in it. Add the garbanzo beans, almonds, zucchini, raisins, and orange juice. Simmer 20 minutes, covered. Add spinach to pot and cook for 5 more minutes. Serve! This meal is bursting with exotic, rich flavors, and is very easy to make. great flavor-be careful not to overcook te vegetables. the vegetables are best just a bit crisp. Add spinach just before serving up the dish.